With merger into the NFL on the horizon, the Kansas City Chiefs and Oakland Raiders met in the last American Football League Championship game on January 4, 1970. Both participants came from the Western Division due to the adopting of a playoff system by the AFL for the ’69 season in which the first place finishers faced the second-place teams in the opposite divisions in the first round. 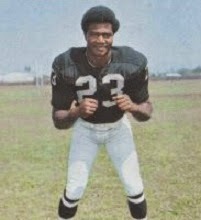 Thus, the Raiders, who placed first in the Western Division with a 12-1-1 record soundly defeated the Houston Oilers, the second place team in the Eastern Division, by a 56-7 score while the Chiefs, the second place team in the West at 11-3, beat the New York Jets, the defending league champs and first place team in the East, by 13-6. Oakland had a first-year head coach in 33-year-old John Madden, but remained the same formidable team it had been in going 25-3 over the last two regular seasons, with one AFL title to show for it. 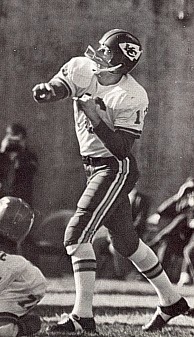 QB Daryle Lamonica threw for 3302 yards and 32 TDs, receiving AFL Player of the Year honors from UPI, and wide receivers Fred Biletnikoff and Warren Wells combined for 26 touchdowns, although Wells was playing with a shoulder separation suffered in the season finale. The running game was less formidable, but HB Charlie Smith and FB Hewritt Dixon were both capable receivers out of the backfield. The defense was at its best in the backfield that included CB Willie Brown and safeties George Atkinson and Dave Grayson. Moreover, the Raiders had beaten Kansas City in both of their encounters during the regular season. The Chiefs, coached by Hank Stram, managed to perform well even when the two key players on offense, QB Len Dawson (pictured above) and WR Otis Taylor, missed time due to injuries. The running game was sound, utilizing a committee approach that included halfbacks Mike Garrett and Warren McVea and fullbacks Robert Holmes and Wendell Hayes running by a line that contained All-AFL performers in OT Jim Tyrer and G Ed Budde. The defense was stable and solid, featuring DT Buck Buchanon, linebackers Bobby Bell and Willie Lanier, and FS Johnny Robinson. PK Jan Stenerud was the AFL’s most reliable placekicker. It was a clear day at the Oakland-Alameda County Coliseum with 53,564 fans in attendance. The Chiefs had the game’s first possession and punted. Oakland moved the ball effectively, with Charlie Smith (pictured below) and Hewritt Dixon running well and Daryle Lamonica completing consecutive passes to Smith for seven and six yards. However, after reaching the Kansas City 44, Dixon dropped a third down pass and George Blanda’s 52-yard field goal attempt fell short. The teams exchanged punts, with neither able to move on offense, until the Raiders put together a drive of 66 yards in ten plays. Lamonica completed five passes, two for short gains to Smith and one to Warren Wells that covered 24 yards to the KC three. From there, Smith ran for a touchdown and, with Blanda’s extra point, Oakland took a 7-0 lead into the second quarter. Once again the teams punted back and forth, with the Chiefs still stymied on offense and the Raiders unable to generate anything further either. Taking possession at their 25 with 3:24 left in the first half, the visitors finally began to move. Len Dawson threw to Otis Taylor for 14 yards and Robert Holmes had an eight-yard run to the 50. Dawson connected with WR Frank Pitts for a gain of 41 yards to the Oakland one and on the next play Warren McVea carried for a TD. Jan Stenerud’s conversion tied the score at 7-7, and that was the tally at halftime. SS George Atkinson returned the second half kickoff 52 yards to the Kansas City 45 and the Raiders reached the 26 before being backed up by a penalty. Lamonica threw two incomplete passes at that point, injuring his throwing hand on one, and Blanda was wide on a 39-yard field goal attempt. Oakland got the ball right back when Mike Garrett fumbled and DT Tom Keating recovered at the KC 33. But once again the home team couldn’t capitalize, gaining nothing on three plays followed by another unsuccessful Blanda field goal attempt. The Chiefs were forced to punt following a short series and Jerrel Wilson’s 29-yard punt gave the Raiders good field position at the KC 48. 41-year-old George Blanda had taken over at quarterback at the end of the previous series and he completed a screen pass to HB Pete Banaszak for a yard and then a throw to Smith that picked up 23 yards to the 24 yard line. But two plays later, a long throw into the end zone intended for Wells was intercepted by CB Emmitt Thomas, who ran it out to his six yard line. Once again the home team had come up empty in Kansas City territory. The Chiefs were pinned deep near their goal line and facing third-and-14 as Dawson faded back into his end zone and threw a high pass that Taylor caught in spectacular fashion for 35 yards. Dawson then connected with Holmes for 23 yards to advance into Oakland territory. A pass interference penalty on CB Nemiah Wilson moved the ball to the seven and Holmes ran for a five-yard touchdown, capping the 94-yard drive. Stenerud again kicked the point after and Kansas City was ahead by 14-7. Lamonica, despite the hand injury that affected his ability to grip the ball, was back behind center when the Raiders regained possession, but the result was a punt. The next Oakland series started at the six yard line and advanced to the KC 39 before SS Jim Kearney picked off a Lamonica pass. However, the Raiders got the ball back when a mixup in the Kansas City backfield resulted in a fumble that DT Carleton Oates recovered. But Lamonica again tossed an interception on the next play, this time by rookie CB Jim Marsalis. Once more the Chiefs turned the ball over in their own territory, this time on a fumble by Holmes that MLB Dan Conners recovered at the KC 31. And once more the Chiefs intercepted a Lamonica pass, with Thomas (pictured at right) picking off his second of the game at his own 20 and returning it 62 yards to the Oakland 18. The result was an insurance field goal with Stenerud connecting from 22 yards with 4:48 remaining on the clock. Kansas City held on to win by a final score of 17-7. The Raiders had the edge in total yards (233 to 207) and first downs (18 to 13). The Kansas City defense mounted a tremendous pass rush and recorded four sacks, in addition to four interceptions. Both teams turned the ball over four times, with all of those by the Chiefs coming on fumbles. Len Dawson completed just 7 of 17 passes for 129 yards, but the completions tended to come in clutch situations and, while he had no touchdown passes, he also gave up no interceptions. Otis Taylor had three catches for 62 yards. Wendell Hayes led Kansas City’s ground game with 35 yards on 8 attempts that included a TD. On defense, DE Aaron Brown was unofficially credited with 2.5 sacks and Emmitt Thomas had the two big interceptions that he returned for a total of 69 yards. For the Raiders, Daryle Lamonica, hindered in the second half by his sore hand, was successful on only 15 of 39 throws for 167 yards and no TDs while giving up three interceptions. In his brief stint, George Blanda went two-for-six and 24 yards and was picked off once. Charlie Smith caught 8 passes for 86 yards while also rushing for 31 yards and a touchdown on 12 attempts. Hewritt Dixon ran for a team-leading 36 yards on 12 carries. WR Rod Sherman contributed three catches for 45 yards while the injured Warren Wells was limited to the one 24-yard reception. Kansas City went on to upset the Minnesota Vikings, champions of the NFL, in the Super Bowl. It was the second straight year in which the younger league came out on top and provided a good sendoff to the AFL before it was absorbed into the NFL. The Chiefs and Raiders became part of the American Football Conference’s Western Division, and Oakland once again finished first in 1970 while the Chiefs placed second at 7-5-2 and out of the postseason.